My first comment is that, in terms of predictions, it seems to me that most matches here, perhaps with the exception of Germany-Algeria (and if I'm allowed to stretch it, Argentina-Switzerland), should be fairly competitive. My second comment is that, the bookmakers are generally correct and, purely as an indication of probabilities of winning, one wouldn't (and shouldn't) venture too far away from their odds: the top most name in the fixture is usually the favourite. This is also intuitive, given the relative strength of each country and how they fared in the Group Stages. Thus, due to this second point, my predictions will be rather obvious but even then I propose to talk and share my thoughts about each fixture separately. At the outset though, I will highlight that the Costa Rica v Greece matchup has the bookmakers most uncertain; whilst Belgium v United States could also be quite interesting. I now divide the draw into a Top-Half and a Bottom-Half, and each Half is in turn divided into "Quarters". Possibly the more "standard" half in the tournament; arguably the chances of an upset here are less probable. 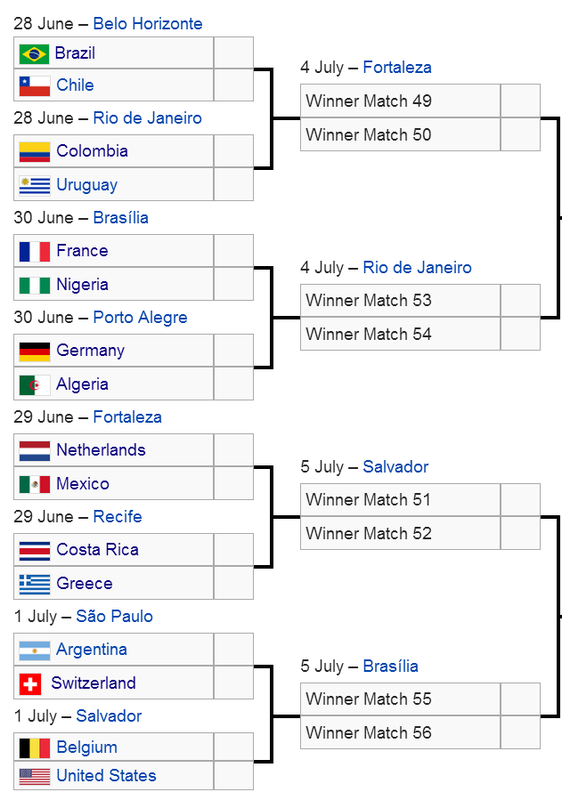 This Quarter Bracket, with the exception of Argentina of course, will see who is the best out of all the South Americans. Winner is quite likely to play France/Germany in the semi-finals. I expect this to be a competitive match. Chile is an all-out attack team, with a more porous defence as they leave behind open-space when going forward. Brazil to some extent is like that too but sadly I think the home team wins here despite Chile being the form team of CONMEBOL. With Luis Suarez gone, and the camp in a bit of a frenzy after all that has happened with their "talisman", I anticipate that team morale will be low and Colombia should win this. This Quarter Bracket sees the seeds expected to win in what is a "properly seeded" contest, but it doesn't mean that the matches will be easy. I expect this to be fairly closely contested but Nigeria have issues with their defence. However the Algerians have held their own (albeit in their rather weaker Group), especially in that match against Belgium, so there will be moments of challenge for Germany. As alluded to above, two to three of the fixtures here may have a possible upset on the cards. 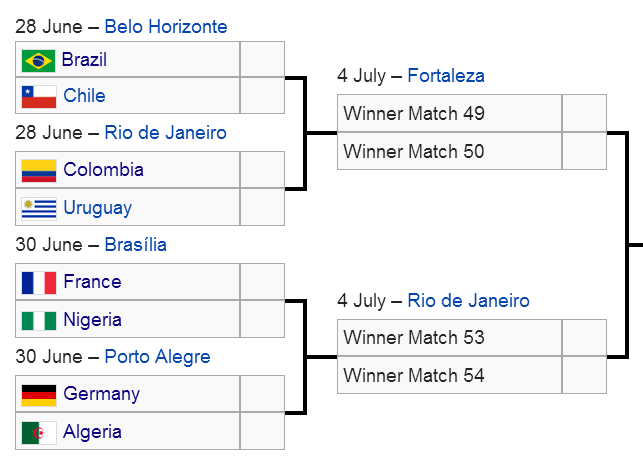 As mentioned in a previous post, this Quarter Bracket sees 4 non-World Cup winners play off for one Semi-Final berth. It's the one I'm most looking forward to. All the teams here, except perhaps Mexico (though they would probably still be happy), will be happy about this draw as it is comparatively easy. We have seen how defensively solid Mexico has been in Group A, though they are capable of scoring as well. We have also seen how attack-minded Netherlands can be with Robin Van Persie and Robben. This is a match that I don't want an upset in. This may go to penalties, but I expect Costa Rica to go through given how well they have played against Italy and Uruguay. However, Greece do have vast amounts of experience and they are quite good even when they don't have much possession (due to their defence and counterattacking ability). I will propose a 1-1 draw, with Costa Rica to win on penalties. In this quarter we have nothing that I can really give a name to - there is one seemingly standard match and the other is a potential upset. Though Argentina have shown weaknesses, they should be able to dispatch of the Swiss. Potentially anything could happen here. The United States remind me a bit of Greece because they make good use of the ball when they have it. A lot of people are calling for an upset here, and I can see it happening. As alluded to above, most of my tips are for the favourite so I have obviously not said anything special or insightful. That being said, with the exception of the Netherlands, I would be happy if I got all my tips wrong as that would make for a very unusual and interesting World Cup. Of course, I highly doubt that will happen.